We were SO happy to usher in SPRING LIKE weather this weekend! We had our very first picnic of the season. This Cherry-Pecan Chicken Salad hit the spot! It is addictive! I love that it only has 5 ingredients and takes less than 5 minutes to throw together. I made it the night before and just packed it up the next day with some hearty crackers and fruit and we had a wonderful AND EASY picnic at the park! I LOVE using a rotisserie chicken for this recipe, because I love the flavor, convenience and really love a combination of dark meat and white meat in my chicken salad. 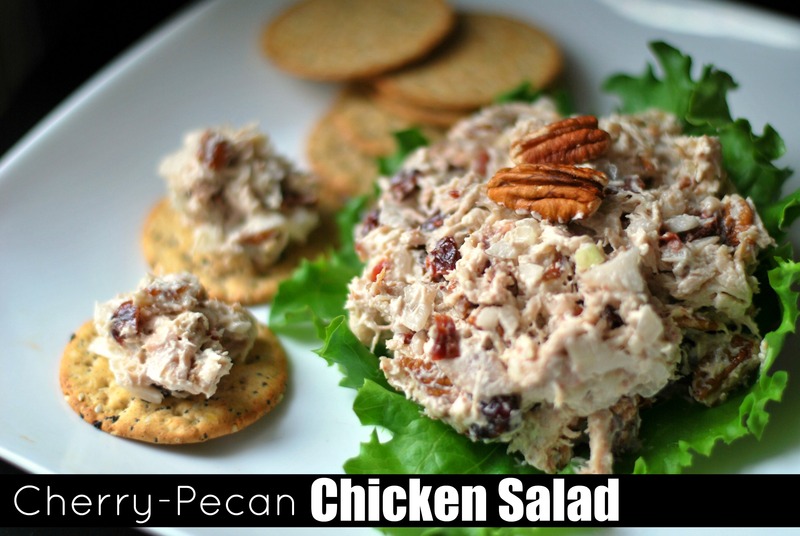 If you would prefer a more old fashioned, southern type chicken salad, check out my Southern Pecan Chicken Salad! Combine chicken, onion, pecans, cherries and mayonnaise. Season with salt & pepper to taste. Refrigerate for a couple of hours or overnight. Serve with hearty crackers or on toasted bread. I think that would work fine. It would probably be yummy with the dried cranberries with the turkey instead of cherries also! Let me know how you like it! I always use dried cranberries. It is DELISH!